Oh my goodness where has time gone! Can you believe it is the 31st of August? 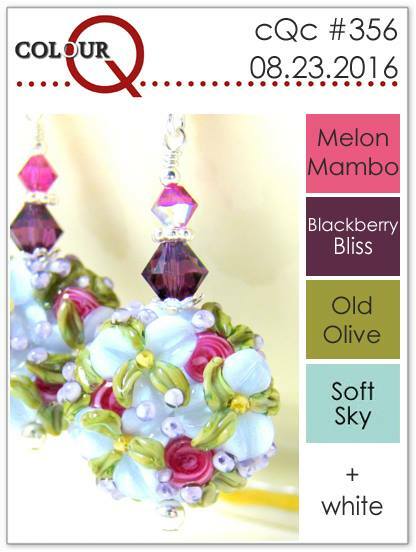 Last day of the month and time for the August edition of The 12 Kits of Occasions! 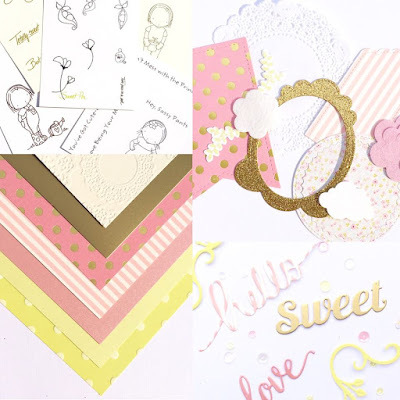 Lisa Elton is our hostess this month and she sent us a gorgeous kit with beautiful papers, die cuts and embellishments! Lots of Rose Gold and foil! This is Lisa's debut kits since she joined the team and I will be honest with you I just wanted to hoard all the pretty contents! I have three card to share today but I have lots to make more once I get my daughter moved this weekend back to school. She starts back up next week. Fortunately most of what she needs is still packed from the move home last spring and at the bottom of the basement stairs right where she left it in April-lol! Let's get on to why you're here. My first card is my favourite, I chose to just add some pink to her. 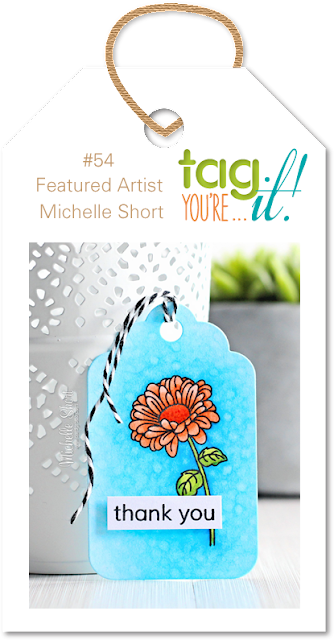 Next up I used an image from the Precious Remembrance Sweet Pea Stamp set that Lisa designed. and finally my last card, isn't that rose gold paper gorgeous? Enjoy hopping around to the other blog and remember that there are two prizes to be won this month! All the details are on the 12 Kits blog! It was so late when I finished my post last night and I forgot to share a few more photos of the kit contents with you! I am submitting all of these to the Simon Says Wednesday Challenge Anything Goes! 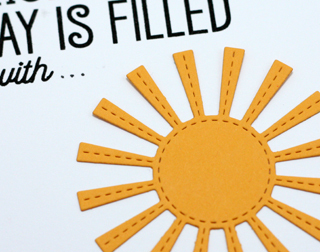 I have been waiting too long to use this cute stitched sun from MFT Stamps. 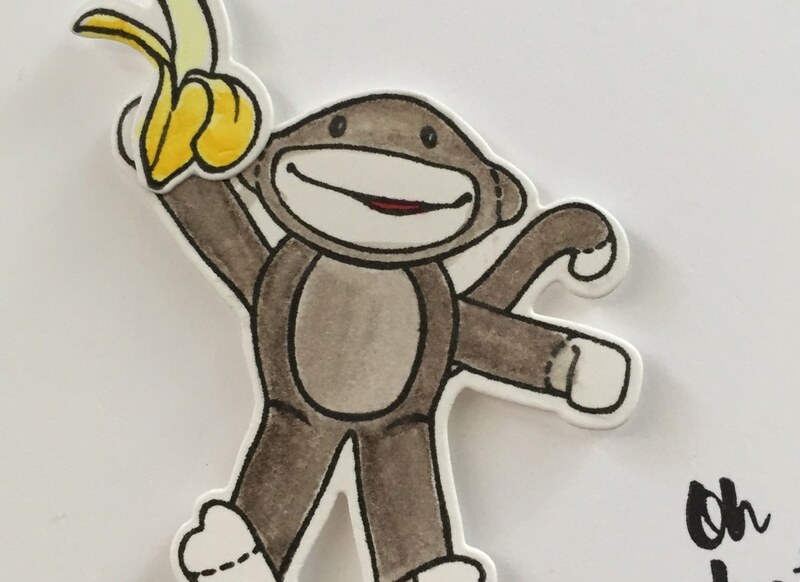 I used a sentiment from Big Birthday Sentiments, masked off a portion of it and drew the '. . .' with a black pen. 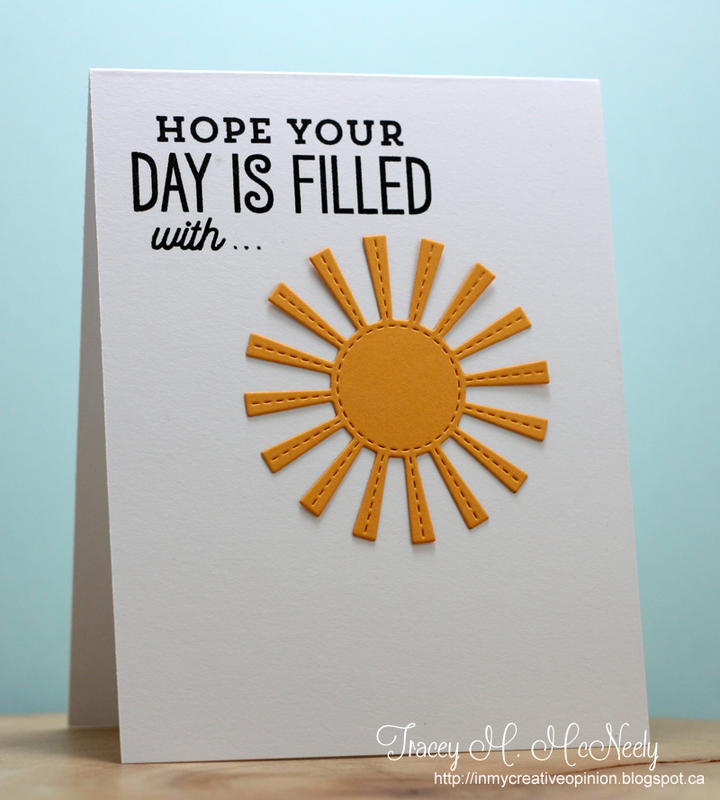 I offset the overall design and snuggled the sun into the sentiment allowing for lots of white space! 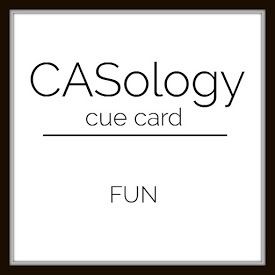 Hop on over to the CASology blog to see what the rest of the team has made to inspire you this week. 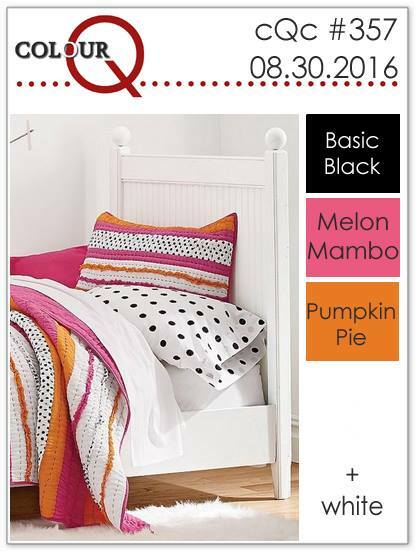 It's time for this week's new colour palette at the colourQ. 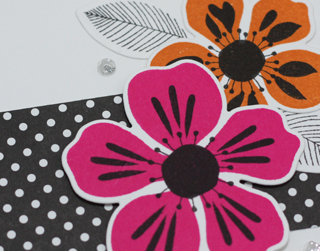 I love these colours together and the perfect opportunity to pull out MFT Stamps Flashy Florals. I can't tell you how much I love this set. 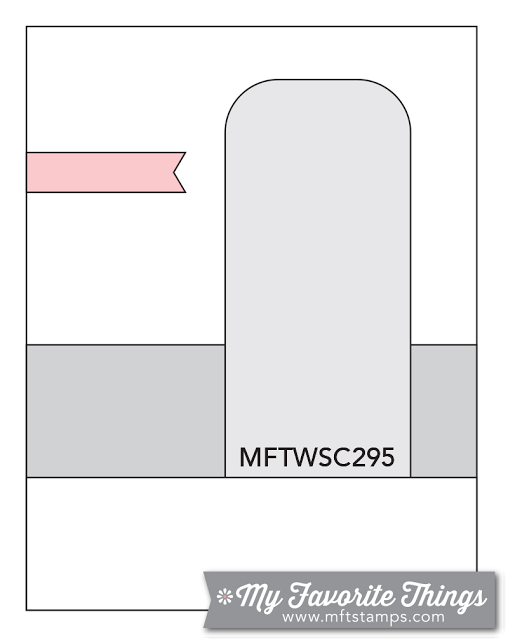 I used MFT Stamps Wednesday Sketch Challenge #295 for my card. Head over to the colourQ to see what the rest of the team made with this week's colours! There's still time to play along with the current Tag You're It Challenge #54! 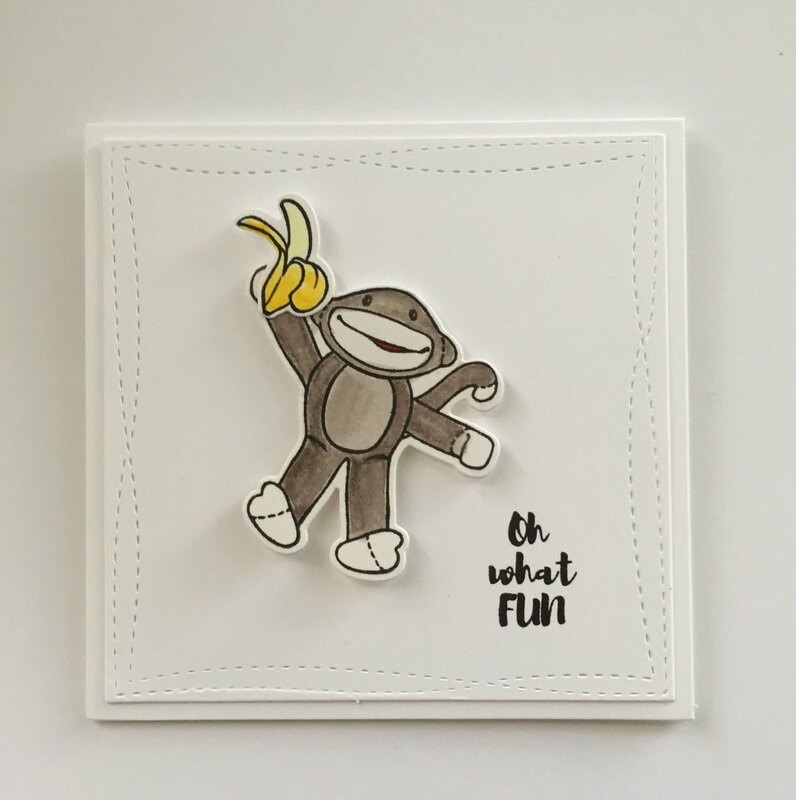 We were so lucky to be inspired this challenge by Michelle Short of The Card Grotto! I love Michelle's design style. 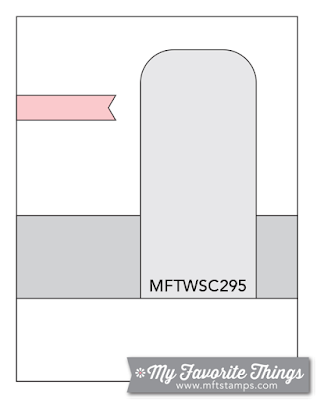 I created my tag very similar to her tag by starting with a white tag and colouring the entire thing. I think this is the first time I have coloured such a large space with Copic markers. 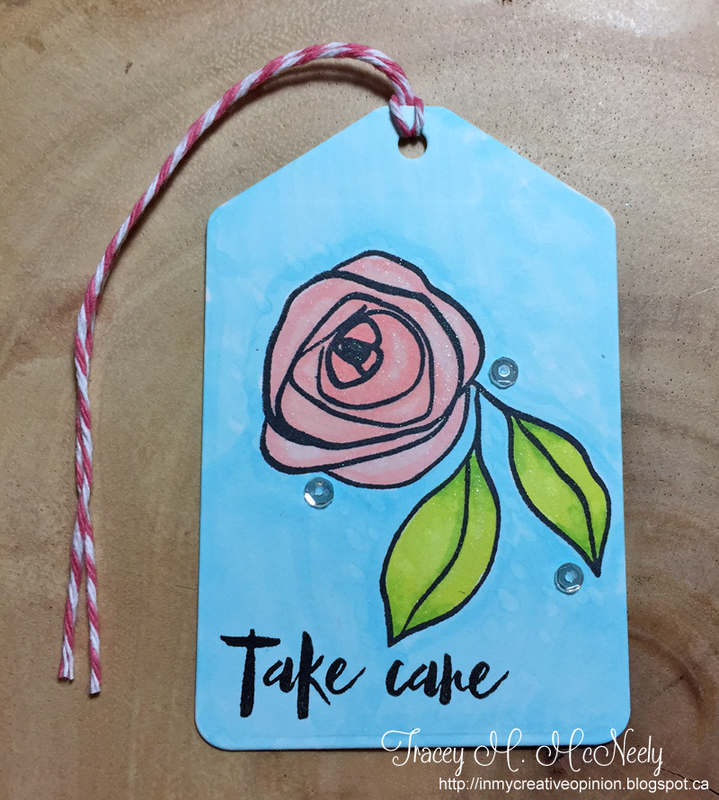 I stamped a bloom from Altenew's Bamboo Rose and coloured the rose and leaves in pinks and greens and then the background using blues. I added a bit of splotching with my colorless blender just like Michelle did but very carefully. Not a good idea to try something new on a finished piece--lol! I painted the entire flower and the leaves with a clear Spectrum Noir glitter marker and added a few sequins to finish it off. Popping in today after what has turned into a really busy summer. 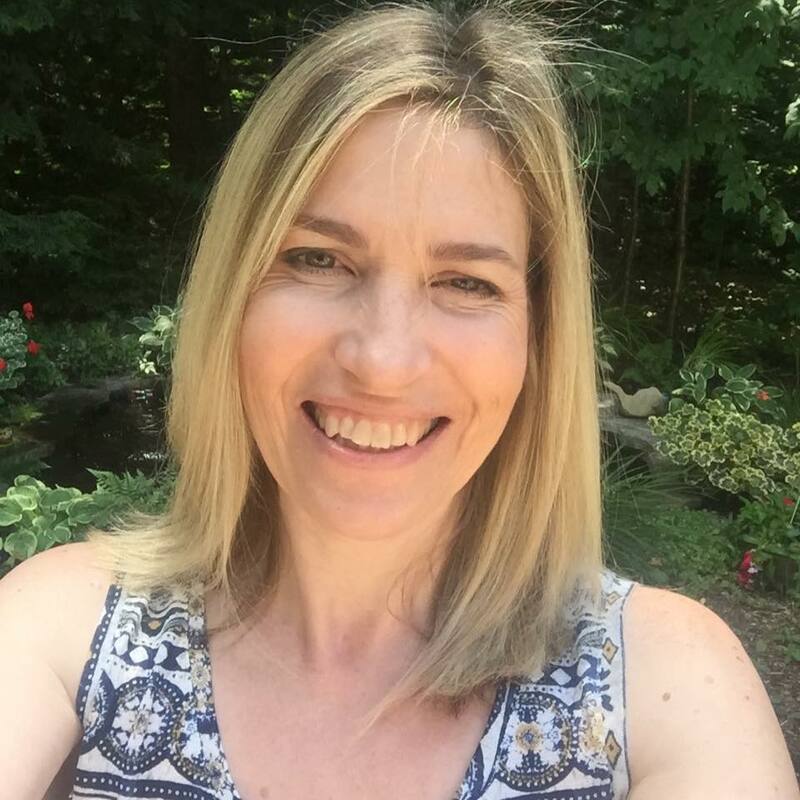 If I were to sit down right now and tell you what I did this summer you would probably shake your head and say that isn't busy and mine probably hasn't been as busy as most, but for me I honestly don't know whether I am coming or going these day--lol! 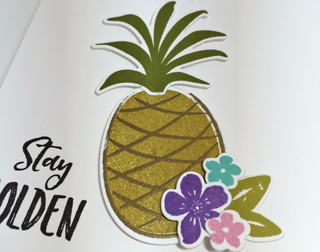 I wanted to share a card I made for my parents for the 67th anniversary using Essentials by Ellen Stay Golden stamps and dies designed by Julie Ebersole. 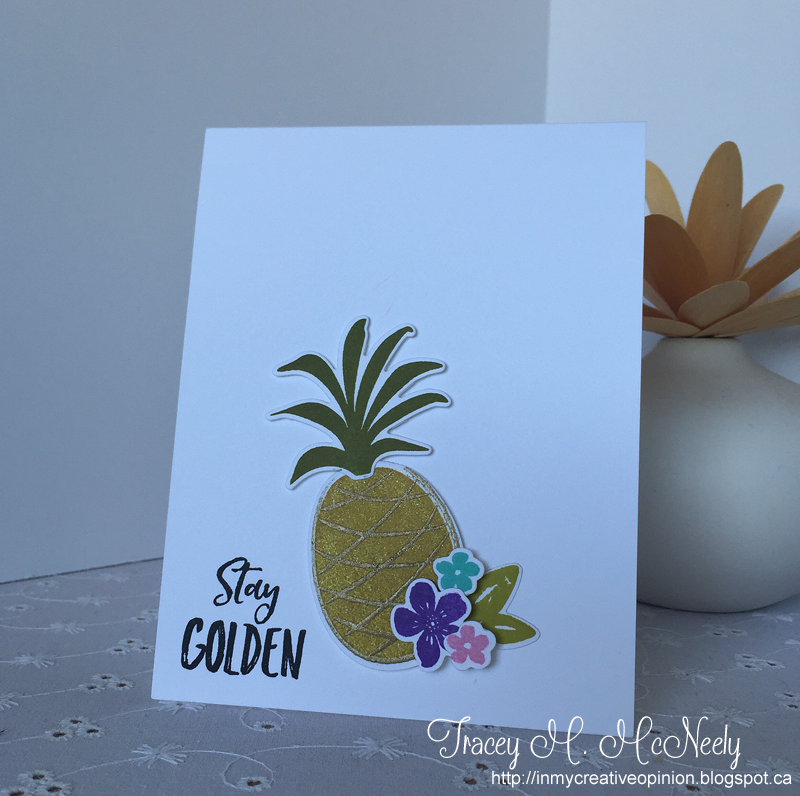 I stamped my solid pineapple with Papertrey Ink's Saffron Spice and then embossed the detail over top in gold and finally I coloured the pineapple with clear Wink of Stella. I added a few flowers from the set and the sentiment. I didn't get the right lighting for the photo t picked up a blueish tone. Much brighter and white in real life. 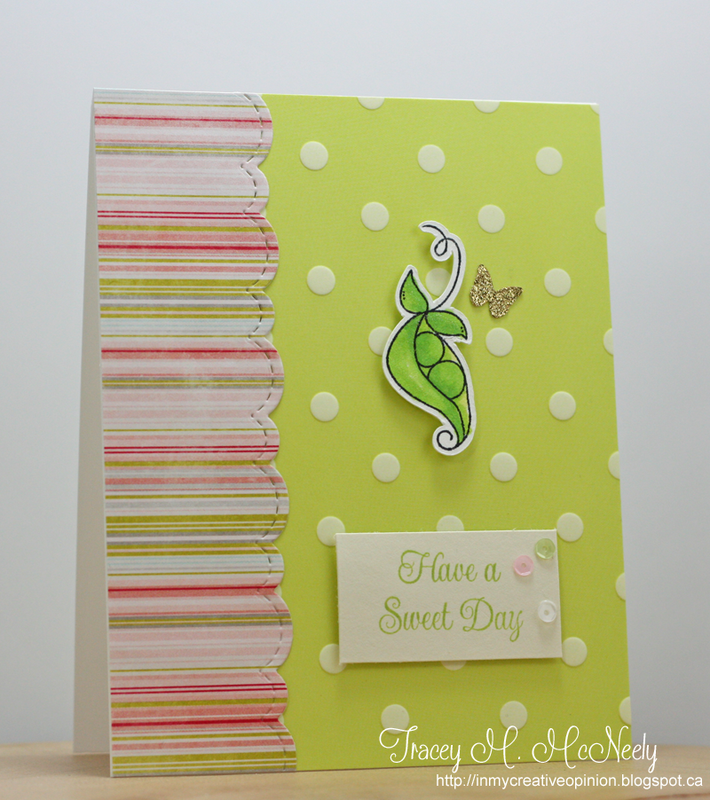 On the inside I stamped a sentiment built from Sugar Pea Designs Celebrate All the Things. ETA: Correction of way too many mistakes--lol! Sorry I typed my post up before bed, my bad. Sharing a card today that I made for my hubby for our 26th Anniversary. Many of you know that he travels a lot for his job, so although he is home on weekends, he was not home this year on the day of our anniversary. Last weekend we did celebrate, we went out for dinner and a movie. We went to see Jason Bourne, so I teased him that I got to spend our date night with my two favourite guys--him and Matt Damon! I created this card for him and put it into his suitcase when he was home last weekend. 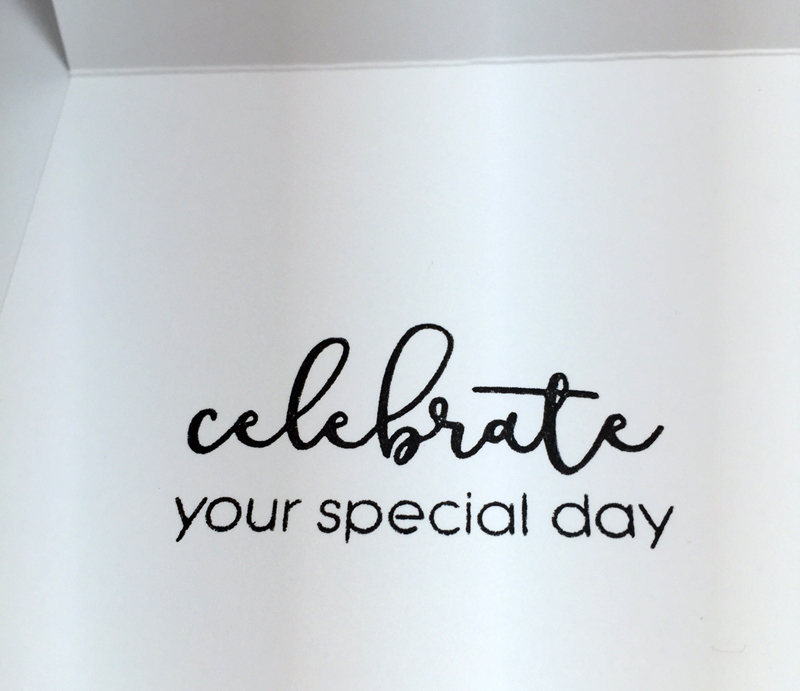 It was my way of letting him know I was thinking about him on our special day. I have so many 6 x 6 patterned paper pads and so I pulled out Pink Paisley's Pen Pals because I knew I would find something to work with it. 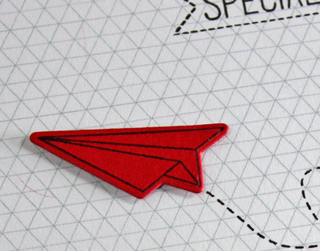 Then I selected Special Delivery by SugarPea Design to use. I used two patterns to create my panel and then stamped directly on the panel and then added the die cut paper airplane with a bit of foam tape.